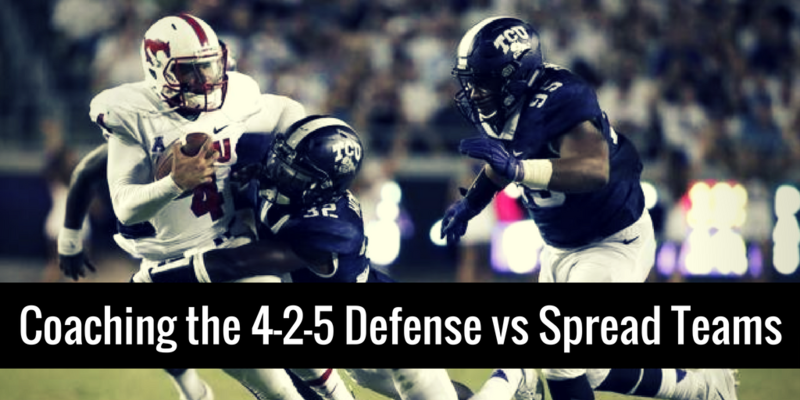 The 4-2-5 is becoming the trendy new answer to all those wide open spread offenses out there. So how do you go about coaching the 4-2-5 defense vs spread teams? Well, let’s talk about it. 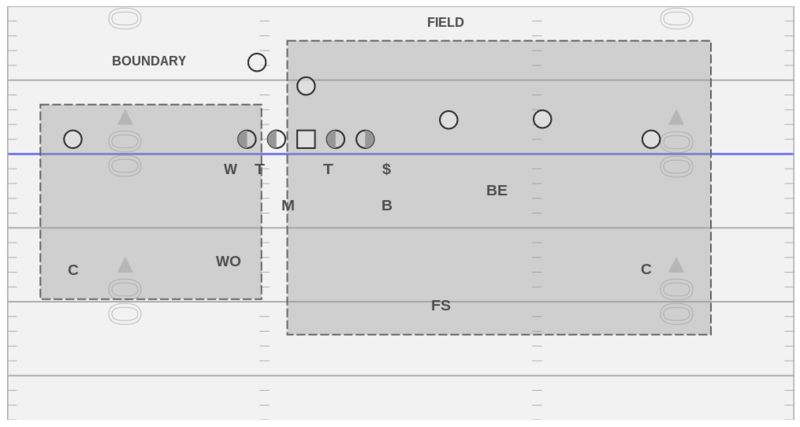 In this video, Coach Pat Fox talks about using a 4-2-5 system to line up and defend the standard 10/11 personnel spread teams who specialize in the zone read that most teams run some form of out of the shotgun. Click the link to watch the whole series of videos on the 4-2-5 Defense. If you’d prefer to read instead of watch a video, check out the notes below. Coach Fox is constantly telling his guys to make sure they’re showing the base alignment before doing anything else. He wants his different calls to look similar and present as confusing a picture as possible to the offense. To do this, he’s always telling them to “strike the pose!” or to get into their base alignment before the ball is snapped. He allows them to do some moving around in the secondary before the ball is snapped, but it’s important that each of their base calls look similar to the opponent, which gives them an edge. This is the standard alignment for the defense when facing a balanced formation on the hash, and it’s worth noting that the calls are split into two separate pieces. 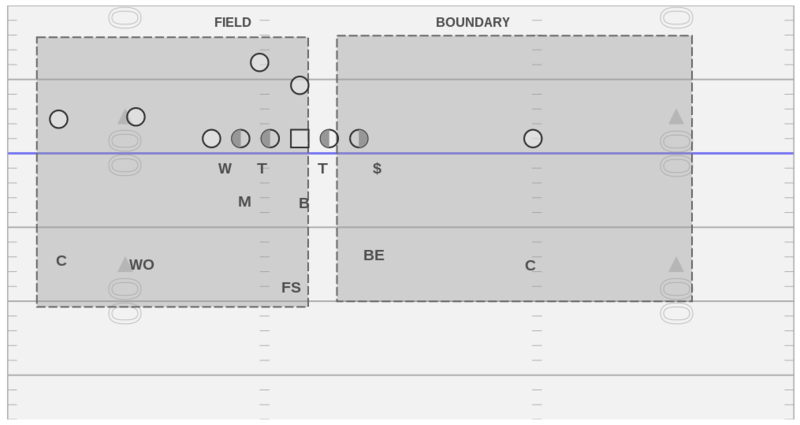 In other words, the “field” side of the secondary gets a separate call from the “boundary” side of the secondary. This simplifies things for the defenders and narrows their range of vision, giving them fewer things to think about and allowing them to play faster at the snap. Now we come to the 4-2-5 alignment against the trips formation to the field. The first thing to notice here is that the defensive front inside the tackle box is adjusted to stay gap sound regardless of where the strength of the formation is located. You always want to stay sound against the run first. 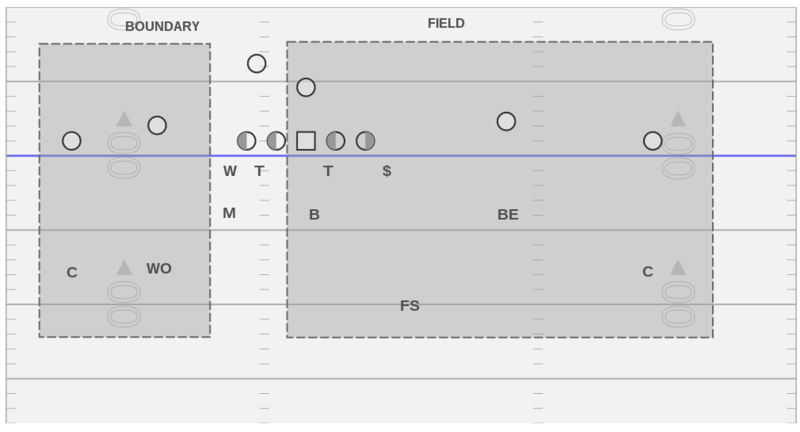 The “Bear” also splits the difference between the #2 and #3 receivers to take away any quick screens or bubble routes the offense may try to that side. Wolf lines up ove the tackles at 8 yards Corners line up over the WR at 8 yards Linebackers aligned at “home base” “Bear” splits the difference between #2 and #3 receivers at a 2 1/2 yard depth. The term “Crazy Ivan” comes from the movie The Hunt for Red October. When the Russian subs were being chased, they had a maneuver when they’d suddenly flip around to face the Americans. This move was called a Crazy Ivan. Using code words like these is just one example of how a good coach can simplify the point he’s trying to make and do so in a creative way. This is the call Coach Fox has his kids make on the field when they’re facing a trips formation aligned into the boundary. In this case, the defense will make a “Crazy Ivan” call and call the field side coverage into the boundary and vice versa. Coach Fox has several great videos in this course on his defensive scheme. Click here to watch the whole thing.